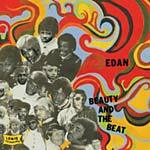 Edan returns with Beauty and the Beat. Guest features by Insight, Precee P, and Mr. Lif! Psychedelia and hip-hop. Those are two words I never thought I'd be relating when referring to one of my favorite albums of 2005. I still can't get over it. What a phenomenal idea. The Boston based rapper Edan possesses more than just an untouchable flow. He's also the producer, programmer, engineer, sampler...you name it, he does it all. The production held within is bafflingly perfect. He's successfully brought the feel of a 60s psychedelic record to the form of hip-hop, including the concept. Clocking in at roughly 34 minutes (as most 60s psychedelic records run), there is absolutely no wasted space. This is an album of epic proportions that rides the line of psychedelia and hip-hop cleaner than you can imagine. It's almost puzzling that a hip-hop record including heavy influence of The Beach Boys' "Pet Sounds", The Beatles' "Sgt. Pepper's Lonely Hearts Club Band", or Pink Floyd's "Piper At The Gates Of Dawn" would come off as such a cohesive set of gems. But it does, and Edan proves he's the man for the job. The album's intro, "Polite Meeting Intro", starts it off with some music that could be from Sponge Bob Squarepants, then with the addition of trippy sound effects and vintage English vocal samples, we end up in The Beatles' "Yellow Submarine". It sets it off nicely. Then comes "Funky Voltro" featuring Insight, which includes a high-pitched swooping Minimoog played by Edan, and also a funky guitar sample. Then comes "I See Colours", a clear standout featuring a synthesizer played by Edan. Edan proves to have a impenetrable flow here, boasting some imaginative lyrics that work very well with the sweet atmospheric soundscapes and soothing 60s vocal and guitar samples. The next cut, "Fumbling Over Words That Rhyme", is also one of my favorites. Edan pays homage to some of the great innovators in hip-hop, including Run D.M.C., Grandmaster Flash Flash, Melle Mel, Kool Moe Dee, LL Cool J, Slick Rick, Nas and Ultramagnetic MC's among others. It seems that a lot of rappers tend to make an "homage" to old-school emcees, but Edan simply does it better by explaining "why" they were true innovators, which is much better in the eyes of this reviewer. "Murder Mystery" is a sweet track with some music similar to Jimi Hendrix's "Are You Experienced" with that reverse rhythm, then cuts in with instrumentation that sounds like it could be from the old "Odd Couple" tv show. The next cut, "Torture Chamber" featuring flows by Percee P, speeds things up with a dirtier beat, orchestra string arrangements, and a background Pink Floyd sample from "Dark Side Of The Moon". Then comes the best collaborative effort on the album; "Making Planets" featuring Mr. Lif. Lif was actually the one who turned me on to Edan, as he was featuring on Lif's "Emergency Rations" EP and his critically acclaimed "I Phantom". The production is especially creepy here, as Lif jumps in towards the end at the climax of the song. "Time Out (Segue)" is a tripped out interlude that blends perfectly to the next superior cut, "Rock and Roll" featuring Dagha. Which features some cool crunching guitars in it's very memorable production. I also love this lyric - "My mental fabric / to big for Lenny Kravitz / Who imitates Jimi Hendrix in every facet". "Beauty" is up next. This song is really one of my favorites. Like it's title, the soulful production is beautiful. The addictive reverse rhythm, tight drum loops, and soaring flute makes it a huge standout. I also love this lyric - "I use pens like hallucinogens". It mixes beautifully into "The Science of the Two" featuring Insight once again. This is another one of my favorites (it just keeps getting better as it goes). "Smile" is one of the trippier tracks on the album. He couldn't have closed out the album better, than with "Promised Land", definitely a standout. It's got a very memorable production, and some sick lyrical spitting from the one, the only, Edan. I see some people complaining about the short run time (34 minutes). I on the other hand, think it's perfect. There is so much filler in today's hip-hop (underground included), that it's nice to have 13 powerful, memorable, carefully crafted tracks to concentrate on. I've spent most of my teen years listening to 60s and 70s psychedelic records, along with a wide array of classic rock, so it may be a bit more intriguing to me than the next hip-hop head, but this stuff is truly unique. Edan may have been paying tribute to hip-hop's greatest innovators lyrically, but he's also paid tribute to 60s and 70s psychedelia in one of the most memorable ways possible; through hip-hop.